Courtney: "Damma.... what are you doing?" Grandma: "I'm reading Jess's blog." We've finally hit the "Why?" stage. Don't you wish you were here? I've stumbled across your blog before, and finally found it again. LOVE IT! I'm utterly inspired by you! Keep it up. These flags are so cute! Orange gets ignored too much. 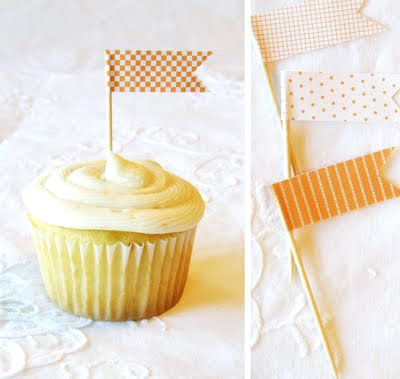 These are so cute, and perfect for an orange-themed bridal shower I'm hosting this weekend! Oh I love cupcakes! When I baked my first batch (with layered colors too) back in February I made some cute anti-V-day cupcake toppers to go along! Damma, definitely. Then I could tell Tourtney all about blodding. Very cute and just in time. I just made some quick ones for my neice's birthday cake. Super cute and would be the perfect craft for my son and I to do together! Thanks!! I love this idea! My sister is training to be a Pastry Chef, and I think she'd love this little decoration idea. Thanks for sharing!